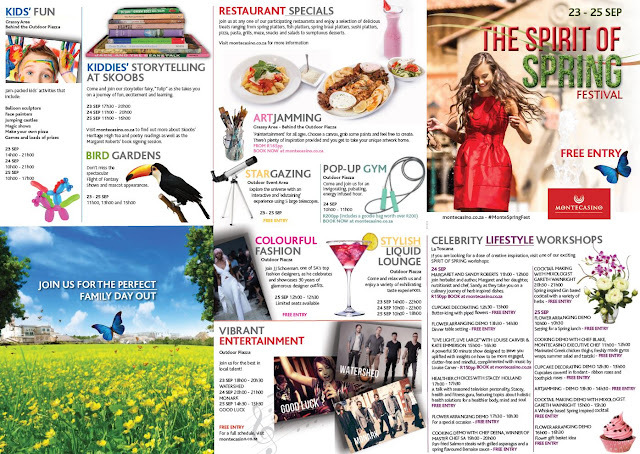 Celebrate the GOOD LIFE at Montecasino’s SPIRIT OF SPRING Festival! No more winter woolies and cozy fires - we’re heading outside on the last weekend of September where we can soak up the sun, enjoy freshly-prepared meals made from the finest local produce, and taste delicious cocktails while listening to live music. The festival includes plenty of exciting entertainment to keep the kids busy and happy while you browse through the latest summer fashions and accessories on our Piazza, attend a variety of spring-themed workshops, or simply relax over sundowners and long lazy meals at one of our outdoor eateries. This is the perfect opportunity to slow down, enjoy time with family and friends, and raise a toast to the last quarter of 2016. Because life should not only be lived, it should also be CELEBRATED! Visit the Montecasino Bird Gardens, which is home to over 750 plants from 37 different plant species; over 60 species of birds, frogs, scorpions; and Annie the world’s oldest female anaconda in captivity, to name but a few. Not forgetting the ever-popular Flights of Fantasy bird show (R35 if you are aged between 2 to 12 years or R70 per adult). Don’t miss out! For more information go to www.montecasino.co.za, join on Facebook at www.facebook.com/montecasino or follow on Twitter at @MontecasinoZA.